Manitoba Housing came forward with a formal request to have the Developer Agreement Parameters amended to ‘not’ install lighting behind homes where the wide pathway network is – specifically behind the visitable homes. The Public Service is recommending to have the lights installed. The Request to amend Development Agreement Parameters with the Public Service’s recommendation came forward to the Riel Community Committee on June 25th, 2018. 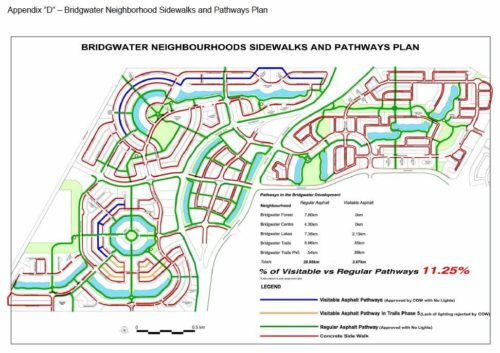 2013: The City’s parks superintendent asked the developer NOT to put in lighting on the pathway BEHIND the ‘visitable’ (pathways shown in blue on map) houses as they would result in additional maintenance costs over the years. Minutes were taken of this request and five city staff were present (four are still employed with the city) The developer accommodated the City’s request and did not install lighting on the pathways behind the homes. 2013-2017: The developer completed Bridgwater Lakes and a large portion of Bridgwater Trails development – and did not install lighting as per the City parks superintendent’s 2013 request. 2017: A NEW parks superintendent started and noticed that no lighting was being installed in a section of Bridgwater Trails (south of the fountain) As per the Developer Agreement with the city – the lights were part of the negotiated contract and the City superintendent ordered the developer go back and install lights behind all the homes in Bridgwater Lakes and Trails that back onto the wide pathway – the wide green corridor that the visitable houses back onto – even though the prior parks superintendent asked that lights not be installed. 2018: Developer has made a formal request NOT to install lights – see Request to amend Development Agreement Parameters. The formal request came to Riel Community Committee (July 9th) The City administration recommends to have the lights installed behind all the homes. I made a motion to NOT install lights behind all homes. I also made a motion to have the Office of Public Engagement reach out to all residents in Lakes and Trails who back onto the pathways behind houses – and to ask them if they wants lights installed or not. I asked this because the decision on whether to install lights or not – is ultimately COUNCIL’S decision. I am very concerned that even though I and the Riel Community Committee members (C Allard and C Mayes – both on the Mayor’s Executive Policy Committee) did not agree with the City administration’s request to install lighting – that potentially other committees will override the Riel CC ‘s decision. Each committee can override the one below it. and – ultimately Council makes the final decision.